Blackstone Thurs+Nola & Pickerings Fri+ 34 North Sat + Weekend Wine! Beer Thursday with Blackstone Brewing Co.! This Thursday, we will have the folks from local favorite Blackstone Brewing in the house to sample ya'll on their line of beers! We have been brewing Craft beer in Nashville since 1994. We are Nashville's oldest and most award winning brewery. In 2011 we built a state of the art brewing and bottling facility. Stop by and check us out. 2312 Clifton Ave.
Stop by between 4-7p & support our local beer scene! Beer Friday with NOLA Brewing Co.! 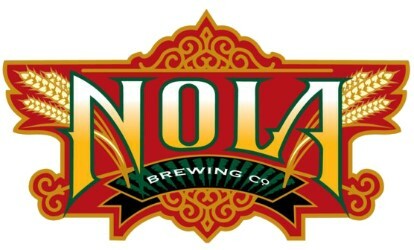 This Friday, we will have a special tasting with the folks from NOLA Brewing Co. to sample you on their beers. At NOLA Brewing, beer runs through our veins. And it’s not because of the keg we just polished off. Beer is our passion. We make good beer for the sake of good beer, inspired by the city we live in with a primary goal of making beer that lives up to its standards. If you’re beer curious, we welcome you to check us out, come tour the brewery, or just have a taste in our Tap Room. Stop by between 4-7p & find your favorite! Special Friday Tasting with Pickerings Gin! This Friday, we will be tasting gin from Pickering's Gin! Pickering's Gin is engineered from 9 botanicals: Juniper, coriander, fennel, anise, cardamom, angelica, lemon, limes, & cloves. We make Pickering’s Gin in the distillery we built ourselves, from scratch, in the heart of Edinburgh. When we opened Summerhall Distillery, it was the first exclusive gin distillery to be established in Edinburgh for over 150 years. Our gin is based on an original 1947 recipe. It features nine Bombay botanicals, engineered by us to create Pickering’s famous full-bodied flavour with perfect bitter-sweet balance. Stop by between 4-7p & check it out! This wine offers enticing aromas of citrus, honey, pineapple and graham cracker. The palate is full and round with flavors of apple, lemon-lime and toasty oak leading to a long finish. 14 Hands Bubbles pairs well with picnics, perfect alongside cured meats and cheeses. Pale salmon color with a fruity nose. Great length and freshness in the palate with flavors of wild strawberries, peach skin and minerals. Heavy, viscous, ripe and dripping stone fruit flavors. High acid makes this feel like it has no more than 2% RS or so. Finish goes and goes. Delightful, complex wine. This wine is made in the style of a German Spatlese with higher residual sugar and lower alcohol. For a “sweeter” Riesling this wine is perfectly balanced and a perfect pairing with spicy Asian food. This wine is bright fruit followed by a well-structured mouth with a good texture. The Syrah from the southern Rhone does not have the finesse of a good northern Rhone syrah, but it has a fresh fruit full of charm. Blackcurrant, oriental spices, licorice and violet. 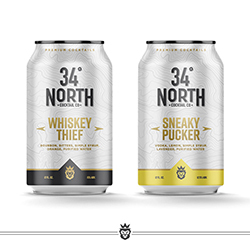 This Saturday, we will have the folks from 34 North Cocktail Co. in the house to sample ya'll on their line of canned cocktails!The spirits based craft cocktails come in 12-ounce cans as a 4-pack and are crafted with high quality spirits and no artificial ingredients. The company has launched two cocktails, one bourbon based that will drink just like an old fashioned that is 15% ABV the other, vodka based with lemon and lavender that is 12.5% ABV. Stop by between 2-6p & taste them! Need ideas for your Easter meals this weekend? We've got you covered! 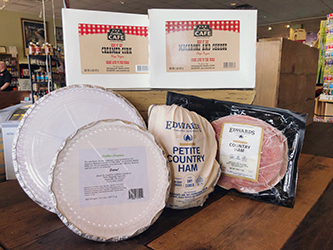 Find them all in our freezer section! 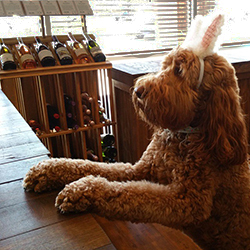 This is your friendly reminder that by law we must be CLOSED on Easter Sunday. Plan accordingly! Have a wonderful and safe holiday! Regular hours resume on Monday, the 22nd. Mantra Thurs+Recover Fri+Weekend Wine+ Moonlight Mead/Rua Sat!